Have you ever felt a hunger so deep that nothing seems to satisfy? Have you been drawing from a source that always seems to run dry? Perhaps what you have been hungering for all along is the Lord. What do these words mean to you? Speak to the Lord about these thoughts, trusting that His love for us is everlasting inspite of our brokenness and weariness. When we come to the Lord, our deepest hunger is satisfied for His arms are always open wide, and His touch restores our life. With God’s grace, may we find that all our heart is hungering for is our Lord, who Himself lived, died & rose from the dead for us. We hope that you have a lovely Thursday! May your hunger for God be filled as you pray with “Hungry” composed and performed by Kathryn Scott. Many thanks to iWorship for the video! 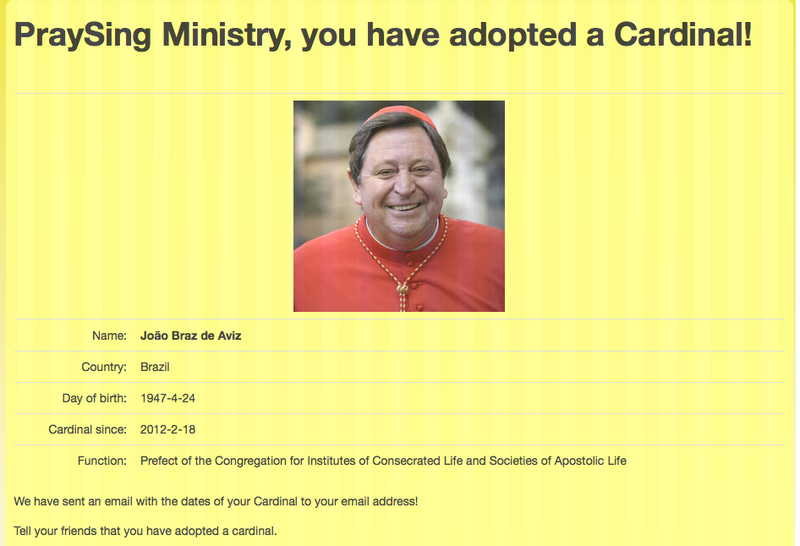 PraySing Ministry's last featured website is Adopt a Cardinal (http://www.adoptacardinal.org/). Are you infinitely thankful to God for having given us such a wonderful, wise and benevolent pope in Benedict XVI? Do you sincerely hope that the Church will be granted a worthy successor: a rock of faith, a leader open to the Holy Spirit, a pope prayerful and holy? As an important part of the Body of Christ do you wish to contribute through the power of your prayers so that the Holy Spirit may guide, protect and enlighten our Cardinals when they determine the next successor of St. Peter? You now have the opportunity to actively be part of this providential endeavor by having a Cardinal assigned to you, who you will support through your prayer and intercession during the coming weeks before and during the conclave and for three days following the election. It's good to know that with our prayers and daily toil we can become part of something great and tie in with a world-embracing Church. In these significant days we not only want to stand side by side to thank God for Pope Benedict XVI and our Church, but also to besiege God to grant us a devout and holy new Shepherd who is strong in Faith and teaching. Well aware how much God yearns for our prayer, coming before him, our call on his Mercy (John 14,13f). This is why this initiative was launched. Let us support our shepherds with the strength of our faith and let us help them carry the burden of these days (Gal. 6,2). So that in our prayers and fasting we may be like Moses and his helpers who with their prayer invoked strength and protection upon their warriors (Ex. 17, 8-15). Like the apostles together with Mary at Pentecost, we want to implore the Holy Spirit (Acts 1,14) to enlighten our cardinals so they may open up to God's will, think His thoughts, do His deeds and speak His words. With all our hearts we hope that God's wise and merciful plans may be put into action through his cardinals. We fervently believe that God takes joy in our prayer and that He is pleased about each one of us who joins in and that He shall gladly answer our prayers (Mt. 18, 19f). This is the last "Wednesday Website" that we will post. We thank you for following our posts for the past six months. We are reformatting our regular posts according to the feedback of you, our followers. Though we shall be stopping posting the "Wednesday Website", interesting links to help you pray and sing to God will still be included in the links section of our main website (http://www.praysingministry.com/). How do you acclaim the Gospel during Lent? Our suggested Lenten Gospel Acclamation is "Praise to you, Lord Jesus Christ." This version is an excerpt from the Gaudium Mass CD and Songbook composed by Tinnah M. dela Rosa. This excerpt shares the Lenten Gospel Acclamation and a sample acclamation verse. We hope this helps you in your celebration of the liturgy this Lent. What is your dream for your country? What is your dream for the world? Spend some time speaking to God about these. Today holds a special place in the hearts of many Filipinos. As we remember the revolution that restored democracy in the Philippines in 1986, we offer this song as our prayer for the Philippines and for our world. Join PraySing Ministry in praying that, "Someday, life will be fairer, need will be rarer, and greed will not pay." Let us pray to the Lord that we may experience this someday soon. This song, "Someday" is a track from the movie "The Hunchback of Notredame," with lyrics by Alan Menken and music by Stephen Schwartz. This version is performed by Chloë Agnew of Celtic Woman. A meaningful Monday to you all! Many thanks to varme0vn for the video! Click here to view the readings for next Sunday (March 3, 2013) via the US Conference for Catholic Bishops website. Revised Roman Missal Q&A #25: What are the particular changes in the text (Part 11: The Invitation to Communion)? The opening half, said by the priest not the people, has two significant changes. The first is that “This is” has been replaced by “Behold”. The change is a more accurate translation of the Latin in the source prayer, “Ecce”. More importantly, the nuances of “Behold” is far more suitable at this point of the Mass. “This is” has an air of mere factual statement about it. “Behold” is also an affirmation of fact, but also contains within it an invitation, to focus on him we are about to receive in Holy Communion. There is, of course, a scriptural allusion here, to John 1:29 when St John the Baptist sees Christ coming towards him and says, “Behold the Lamb of God, who takes away the sin of the world”. John did not use the rather tepid words “this is”. Rather the original Greek is ide, which is an exclamation, and is matched well in English by “behold!”. While John is said to have mentioned “sin” rather than sins, the Church has deliberately made this plural, “sins”. The second significant change in the celebrant’s part is that they are “blessed” who are called “to the supper of the Lamb”. In Greek the same word, makarioi, can be used both for “happy” and “blessed”, which we have all experienced, possibly without realising it, in the differing translations of the Beatitudes. However, apart from the Kyrie, and some Hebrew words we do not translate at all (Alleluia, Hosanna), the source language of our liturgy is Latin. In the Latin text of the Mass we find at this point beati, which though it also admits of being translated as “happy” in certain contexts, usually always has the sense of ”blessed” in ecclesiastical Latin. Perhaps in our modern context, where it is so easy to seek “happiness” in earthly and passing things, the nuance of blessing is more appropriate, pointing us to supernatural gifts and a heavenly destiny. And a heavenly destiny is certainly to the point here, as we see in the change to “supper of the Lamb”. Once again, this is an accurate translation of the Latin original, cenam Agni. Moreover, it is yet another example of the revised translation making more explicit the scriptural references with which the Mass is filled, in this case Revelation 19:9, “Then the angel said to me, ‘Write this: Blessed are those who have been called to the wedding feast of the Lamb’.” So, more importantly, the change makes it clear that the reference is not directly to the Mass we are celebrating at that moment, but to the heavenly banquet that the elect will share with Christ. We receive the Lord’s Body at Mass precisely that we may be made worthy to sit with him at the heavenly banquet. We can now hope to be there, but we cannot presume that we will be. The second half of this invitation to communion dialogue has attracted more attention, in particular “that you should enter under my roof” which replaces “to receive you”. Here again, the translators are following the principle that allusions to scripture in the Mass must be made clearer and more explicit. In the current translation we do not hear the scriptural echo; in the revised translation we do. The reference of course is to the healing of the centurion’s servant in Luke 7:6-7. Now in the context of general usage “receive” is a sensible translation: we receive the Eucharist and we also receive visitors to our homes. In fact there is a lovely ambiguity in the current translation. However, the Church considers it more important that we identify with the centurion as we receive the Lord in his Body and Blood. It is why this element of the Mass was included in the first place. The centurion’s faith-filled humility is what we aspire to emulate at Communion. The new translation makes this more immediately obvious. This is a case of a good translation giving way to a better one, for pastoral above stylistic reasons. Today, we are no longer saying “I shall be healed” but “my soul shall be healed”. The body and soul elements of human beings are distinct. For a start, our souls are immortal, our bodies are not. Our bodies die, though thanks to Christ’s saving self-sacrifice, our bodies will live again at the end of time. Our more desperately required healing, then, is not for a body which will die, but for a soul that could yet be lost to the disease of sin. Moreover, we should not lapse into the mistake of thinking the body contains the soul. Rather it is the soul that, as it were, contains the body, gives it life and form and directs it rightly. In the Genesis account of creation God breathes into Adam’s inanimate body to give it life, that is to say, he gave it a soul. If our souls are healthy our bodies will have a health that may include, but certainly transcends, mere health in a medical sense. who takes away the sins of the world. * Much of this reflection is lifted from the blog of a Benedictine monk, Fr. Hugh Somerville-Knapman, OSB. To read the whole write-up, please go to this link. If you were assured beyond measure "Don't give up for you are loved," would you give up? If God were to sing you a love song with the lines, "When your heart's heavy I, I will lift it for you... When you're lost inside I, I'll be there to find you... If darkness blinds you I, I will shine to guide you," how would you feel? Imagine God singing this song to you with all the love only the Lord is capable of. How would you respond? Spend some time to ponder on the many ways that you are loved. Allow yourself to grow in gratitude for the love that you are experiencing. May this song "You Are Loved" performed by Josh Groban remind you to never give up on yourself and on others. Afterall we all are loved by God beyond measure. Have an inspired Friday! Many thanks to Silchie78 for the video! "All things work for our good though sometimes we can't see how they could." When life's trials become too challenging, just remember that "God is too wise to be mistaken, too good to be unkind. When you don't understand, when you don't see God's plan, when you can't trace God's hand, trust God's heart." Are you willing to trust God's heart? Speak to the Lord about this. Ask God for the grace to trust in his goodness. Remember that God loves each one of us unconditionally. 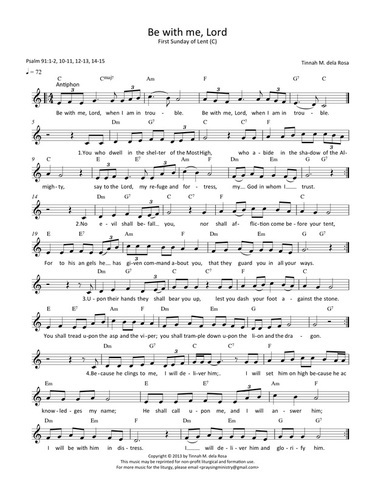 We hope you have a lovely Thursday as you pray with "Trust His Heart" composed by Eddie Carswell and Babbie Mason. Many thanks to musicANDpraise for the video! Today's featured website is Other6 (www.other6.com). Some of us find God at church on Sundays, but how about the other six days of the week? Other6 is an online community dedicated to helping each other experience God at all times, in all things. Patterned after the Ignatian prayer Examen, it asks us two questions: "Where did you find God today?" and "Where do you need to find God today?" This Lent, one of their features is "Other6 Prays Lent" where each day of the Lenten season, guide questions are given as a specific point for the Examen. May this online community help you pray and find God in all things. 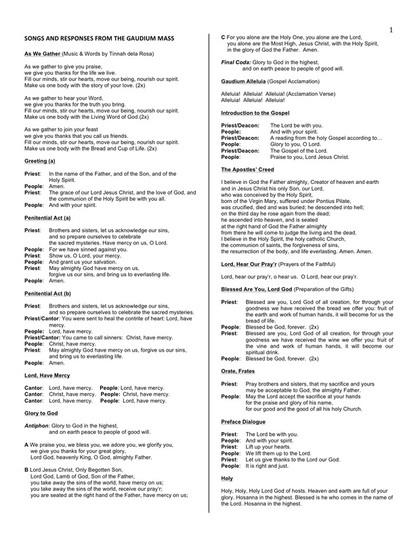 Our PraySing material today is a lyric sheet of the Gaudium Mass to guide congregations and choirs during the mass. It includes all the responses that can be recited or sung that are also found in the Gaudium Mass. Feel free to reproduce both pages for your rehearsals and liturgies. Both pages can be downloaded here or by clicking the picture. Our Monday Prayer is "Better Than I," from the movie Joseph, King of Dreams. This song was composed by Daniel Pelfrey and performed by David Campbell. From the meteor blast that showered over Russia last week, the many incidents of senseless crime and violence we pick up in the news daily to the personal struggles we come to face, many are left asking the question "Why?" or "Why me? or "Why them?" or "Why now?" Perhaps you, too, have asked these questions at some point in your life and were left with few answers to satisfy such questions. As you pray with this song, we invite you to lift up to the Lord these things that leave you questioning and confused. We invite you, too, to "let go the need to know why" with full trust that the Lord understands all and knows better what is good for you and I. 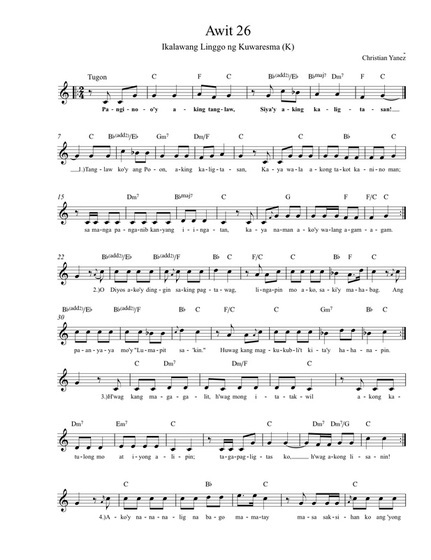 This Tagalog psalm setting for next Sunday is an original composition by Christian Yanez for PraySing Ministry. 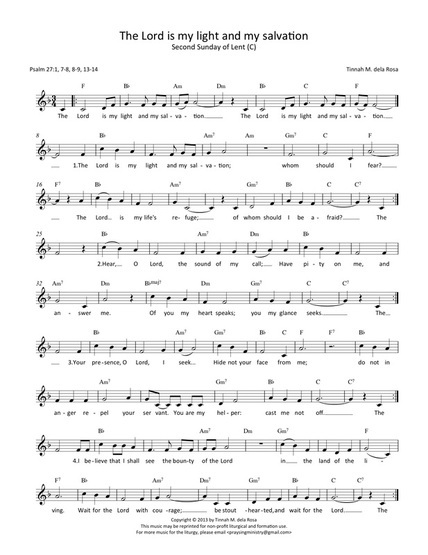 Please download both pages of the music sheet here or click on the picture to download the high resolution PDF file. Click here to view the Tagalog readings for next Sunday (February 24, 2013) via the Euchalette from Word and Life Publications. Wondering why the English and Tagalog psalms for the 2nd week of Lent are numbered differently? Two-thirds of the text in Greek and Latin are Psalms 9 and 10 in the Hebrew Bible. It is because of this that the numbering of the Bible is different from hereon in some translations, depending on whether the Bible was translated from the Greek, Latin or Hebrew text. Click here to view the readings for next Sunday (February 24, 2013) via the US Conference for Catholic Bishops website. R. (1a) The Lord is my light and my salvation. R. The Lord is my light and my salvation. have pity on me, and answer me. Of you my heart speaks; you my glance seeks. Your presence, O LORD, I seek. do not in anger repel your servant. You are my helper: cast me not off. Revised Roman Missal Q&A #24: What are the particular changes in the text (Part 10: The Lord's Prayer)? Archbishop of Cebu Jose S. Palma, D.D., then President of the Catholic Bishops' Conference of the Philippines (CBCP), clarified in his letter dated October 3, 2012 that in 1976, the CBCP voted to adopt the English ecumenical version of the Lord's Prayer. It is what has been in use since then. However, in 2011, the CBCP approved entirely the new English translation of the Roman Missal in which the text of the Lord's Prayer is the 16th century version. In effect, what is contained in the said new English translation must be followed. Thus, during the 105th CBCP Plenary Assembly in July 2012, the CBCP reaffirmed its decision to use the 16th century text in the Revised Roman Missal that has been in use for many decades in the rest of the English speaking world. An obvious change in the Lord's Prayer is in the invitation to the Lord’s Prayer. The Latin has only one introduction, which the 2010 version translates: “At the Savior’s command and formed by divine teaching, we dare to say”. The 1973 version, on the other hand, has three additional formularies. Let us pray for the coming of the Kingdom as Jesus taught us. your will be done on earth as in heaven. For the kingdom, the power and the glory are yours, now and forever. * You may read the CBCP clarification here. but deliver us from evil." and the coming of our Savior, Jesus Christ. For the kingdom, the power and the glory are yours now and for ever. Our Friday Inspiration is "Something More," performed by Lea Salonga with lyrics by Johnny Go, SJ and music by Manoling Francisco, SJ. In the different seasons of our life, this song may speak to you when your soul becomes restless, when your heart becomes hardened, when you grapple with skepticism, or when you are seeking for "something more" in life. Whatever season of life you may find yourself in, may this song lead you to a moment of prayer. May you find time in this busy week to seek the Lord who never tires of seeking your heart. * This song is from the album Something More: Songs for Skeptics. Please patronize our Original Filipino Music. Many thanks to mhcaillesrn for the video! Our featured music this Thursday is "I Will Be Here” composed by Steven Curtis Chapman and performed by Gary Valenciano. The world celebrates love in its various forms today. On this day of hearts, we celebrate our romantic love as well as our other loves for parents, children, siblings, relatives and friends. But on a day such as today, we can tend to focus solely on our love for another and forget the Source that animates that love - God. This beautiful song reminds us of the kind of love that is true, everlasting and unconditional. It is like the love freely given to us by God even if we don’t deserve it. Let us reflect on this genuine and limitless love of God for each and everyone of us. How many times has the Lord assured us in ways beyond our imagination and expectation? When was the last time you told Him that you will also be there for Him? Spread God’s love today. Have a love-filled Thursday! Many thanks to KLASIKSOUND for the video! As we begin our Lenten journey, we are featuring the website of CRS Rice Bowl (http://www.crsricebowl.org/). CRS Rice Bowl is Catholic Relief Services’ Lenten faith formation program that helps us to live in solidarity with the poor and vulnerable around the world. It may be used and adapted in parishes, schools, religious education programs and by families and individuals in the home. 4. GIVE sacrificial donations with a spirit of generosity to our brothers and sisters in need, honoring Jesus' call to serve our neighbors. Help us this Lent to let go of those things that weigh us down. And help bring life to our brothers and sisters who struggle with hunger and poverty. May we proclaim the dignity of life, and celebrate the witness of your love each day. Through prayer, fasting and almsgiving, we deepen our relationship with Christ and prepare ourselves for the great celebration of Easter. As we start the Lenten Season today, may this site be a good resource for concrete ways to act on your faith. The psalm setting for Ash Wednesday is an original composition by Tinnah M. dela Rosa for PraySing Ministry. Click here to view the readings for Ash Wednesday (February 13, 2013) via the US Conference for Catholic Bishops website. R. (see 3a) Be merciful, O Lord, for we have sinned. R. Be merciful, O Lord, for we have sinned. Our prayer today is "More Than Words" by Steven Curtis Chapman. There are prayers that we have uttered from when we were children that we still tell God until this day. By now we probably tell God the same lines each time we pray. But have these repeated lines become mere words that you have memorized but no longer mean? Have they become automatic statements that are offered by our lips but not our hearts? As we begin this week, let us ask the Lord to refresh the way we pray so that every line and phrase we say becomes more than mere words, but meaningful prayers from the heart. Many thanks to lovemewise for the video! Click here to view the readings for next Sunday (February 17, 2013) via the US Conference for Catholic Bishops website. R. (cf. 15b) Be with me, Lord, when I am in trouble. R. Be with me, Lord, when I am in trouble. that they guard you in all your ways. you shall trample down the lion and the dragon. I will set him on high because he acknowledges my name. I will deliver him and glorify him. Revised Roman Missal Q&A #23: What are the particular changes in the text (Part 9: The Mystery of Faith)? After showing the chalice to the assembly, the priest announces: "The mystery of faith." What is the mystery of faith? It is something that surpasses human comprehension, not because the words that state it are wrapped in obscurity, but because the truth itself simply lies beyond human logic and philosophy. The mystery of faith is God's unfathomable plan unknown in ages past to save humankind in the most extraordinary way that defies human reason. Jesus Christ revealed that plan and faithfully carried it out. He took our human nature and died for our sake. The acclamation by the people is sometimes called memorial acclamation because it calls to mind the death and resurrection of the Lord. Three sets of acclamation by the assembly are offered below. In all of them the refrain has something to do with the paschal mystery. Christ's paschal mystery is the mystery of our faith. It is the subject of the memorial acclamation. (iii) Lord, by your cross and resurrection, you have set us free. (iv) Christ has died, Christ is risen, Christ will come again. Priest: The mystery of faith. for by your Cross and Resurrection, you have set us free. Our inspirational post today is the soundtrack "Fill the World With Love," from the movie Goodbye, Mr. Chips with lyrics by Petula Clark. Ponder on these words for a moment: "Was I brave and strong and true? Did I fill the world with love my whole life through?" Whether you are in the morning, noontime or evening of your life, at the end of the day these questions can help us evaluate where our life is and where we want it to be headed. How bravely do you face the storms that come your way? How strong is your faith or your hope? How truly authentic is your love? 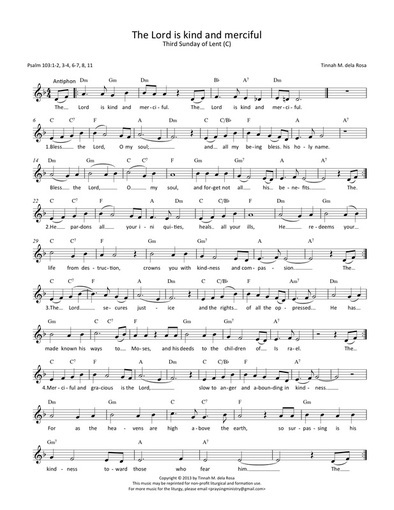 Spend some time speaking to the Lord about your response to the questions posed by this song. What is the Lord's invitation to you in your life now? Many thanks to dongmarit for the video! PraySing Ministry's featured music this Thursday is "Still My God" performed by Avalon. In this journey called life, we experience many things. We may be on top of the world at some point or hit rock bottom at other times. However, God meets us where we are. Of all the uncertainties in our life, God is constant. He is always there journeying with us. Sometimes we just need to stop for a while and reflect and see the Lord in all aspects of our life. Open up to the Lord about your concerns and what you have you been or going through. Where did you find the Lord? How did the Lord find you? As you pray with this song, seek the Lord’s invitation. How will you respond to His invitation? Is the Lord still your God? Many thanks to ViniciusVEvangelista for the video! PraySing Ministry's featured website for today is the Busted Halo (http://bustedhalo.com/). We live in an age filled with seekers who are desperately trying to find deeper meaning in their lives but whose journey has little to do with traditional religious institutions. BustedHalo.com believes that the experiences of these pilgrims and the questions they ask are inherently spiritual. Based in wisdom from the Catholic tradition, we believe that the joys and the hopes, the griefs and the anxieties of the people of this age are the joys and hopes, the griefs and anxieties of all God’s people. Nothing genuinely human fails to raise an echo in their hearts. BustedHalo.com strives to reveal this spiritual dimension of our lives through feature stories, reviews, interviews, faith guides, commentaries, audio clips, discussions and connections to retreat, worship and service opportunities that can’t be found anywhere else. We are committed to creating a forum that is: open, informed, unexpected, unpredictable, balanced, and thought-provoking. Every time we ask questions about what our lives mean and what keeps us alive, we are talking about something that’s relevant to BustedHalo.com. Under the direction of Fr. Dave Dwyer, CSP, Busted Halo® Ministries helps young adults explore their spirituality, listen to and encourage one another, discover (or re-discover) the rich depths of Catholic tradition, and connect to communities of faith where their unique gifts will be respected and used, and where they will find support on their journey towards God. We also promote ministry to-by-and-for young adults in Catholic parishes and dioceses across the United States and Canada. We help local communities of faith better incorporate those in their 20s and 30s into the lay mission of the Church in society. Founded in September of 2000 by Fr. Brett Hoover, CSP, and Mike Hayes, Busted Halo® continues to seek out new ways make the connection between young, spiritual seekers and the community of the Church. Busted Halo is an online magazine for spiritual seekers. It is an outreach of the Paulist Fathers. Our PraySing Ministry material today is an excerpt of the song "Lord, Be In My Life" by Tinnah dela Rosa. This song invites the Lord to fill our vision, thinking, loving and serving. It is an appropriate song during communion. Today, we invite you to pray with the lyrics of this song: Lord, be in my life. Fill me with your fire. Lord be in my living. Live, O Lord, in me. This song is one of the 29 tracks in the Gaudium Mass CD. Learn more about the Gaudium Mass by going to this link. Our Monday prayer is the song "As The Deer" by the Maranatha! Singers. What do you long for? Why do you yearn for this or these? Are these longings and desires able to quench the thirst you have for love, for life, for purpose? Speak to the Lord about this in prayer. Ask God for the grace to seek Him that you may be able to long for Him just as the deer longs for running waters. The psalm setting for next Sunday is an original composition by Sutarto, PraySing Ministry's contributing composer from Indonesia. 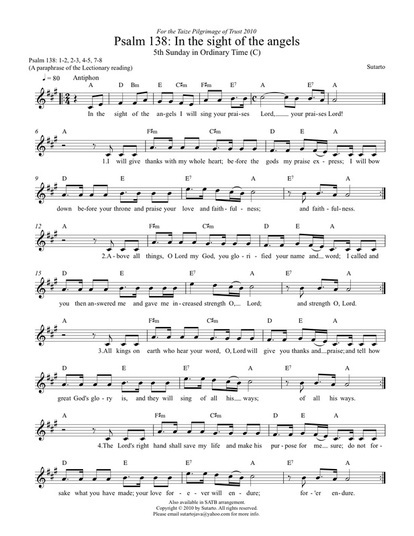 This psalm setting was composed for the final mass of the Taize Pilgrimage of Trust in 2010. It is a paraphrase of the Lectionary version of the psalm for next Sunday. Click here to view the readings for next Sunday (February 10, 2013) via the US Conference for Catholic Bishops website. For more music on the liturgy, please contact us. If you want to get daily updates from us, please LIKE us on Facebook or follow us on Twitter! R. (1c) In the sight of the angels I will sing your praises, Lord. and give thanks to your name. R. In the sight of the angels I will sing your praises, Lord. your name and your promise. you built up strength within me. Your right hand saves me. Revised Roman Missal Q&A #22: What are the particular changes in the text (Part 8: Holy)? The Sanctus echoes the prayer of the angels and saints in Heaven, the prayer that Scripture describes the hosts of Heaven making to the Almighty (Isaiah 6:3, c.f. Rev 4:8). It is crucial to render precisely the Hebrew phrase Yahweh Sabaoth to reflect the prophet Isaiah's vision of the Lord of the heavenly armies. “Lord God of hosts” is closer to the Hebrew. "Hosts", meaning an army, is not to be mistaken as the Eucharistic bread. “God of hosts” is a Scriptural term referring to him as the powerful Lord of hosts and armies. The new translation of this phrase is one of many examples in the new translation where we will now be better able to detect the use of the Bible in the liturgy. Lord God of power and might. Our Friday Inspiration post is a song from the Prince of Egypt soundtrack, "Through Heaven's Eyes," performed by Brian Stokes Mitchell. Our lives form part of a larger tapestry, a grand design. Our dreams are part of God's larger dream. They are not simply for our good but for the good of all. Our worth cannot be measured by mere human standards for it is God who gives us our authentic dignity. How do you measure your value? Have you considered your life's worth using heaven's eyes? Speak to the Lord about this in prayer. Many thanks to willowsapling for the video!